Beautiful locally grown roses are in season right now! 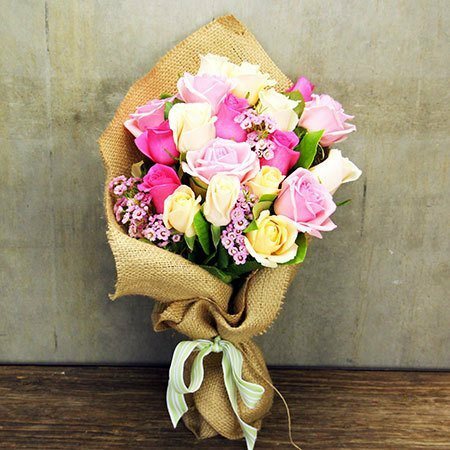 So make hay while the sun shines and celebrate with a sweet posy of mixed roses in pretty pastel shades of pink, peach and perfect white. 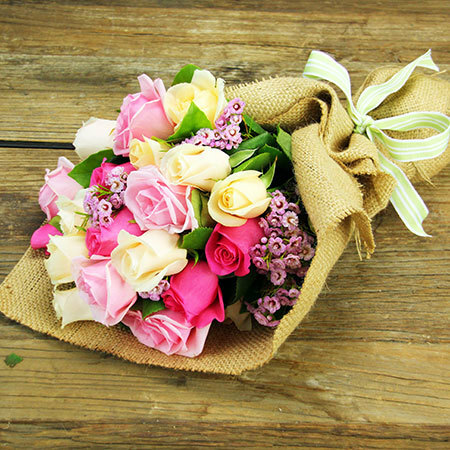 Our florists combine fresh greenery and touches of native pink wax flower amongst the roses and wrap the flower bouquet with a rustic hessian wrap and ribbon. Excellent value at only $39.95, this is a fab gift for any occasion just as it is, or paired with a bottle of bubbly or freckle milk chocolate from our wonderful range of quality gift add ons! 2017-01-12 Great service delivered fresh and on time. Great value for money and the candle was a hit! 2017-01-10 Service rating : Service over the phone was quick and easy. The lady I spoke to was friendly and helpful. I also called on the day to see when the flowers were going to be delivered and the service I got on that day was also friendly and helpful. The only thing that I was disappointed in was the flowers were not like the photo on the internet. The photo seemed to show more flowers than what we actually received. Product : Not like the photo on the internet - looked we received less flowers. 2017-01-10 Service rating : Great service and will defiantly use them again. It would be great if you could track your delivery. Product : My friend absolutely loved them. The free gift of a candle was beautiful. 2017-01-06 I ordered the flowers late the night before and the flowers were delivered the next day as promised and my mother in law loved them and said they were just gorgeous. Would recommend their service!